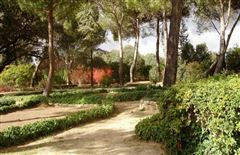 The estate comprises a variety of different buildings which cover an area of around 3,000 square meters. 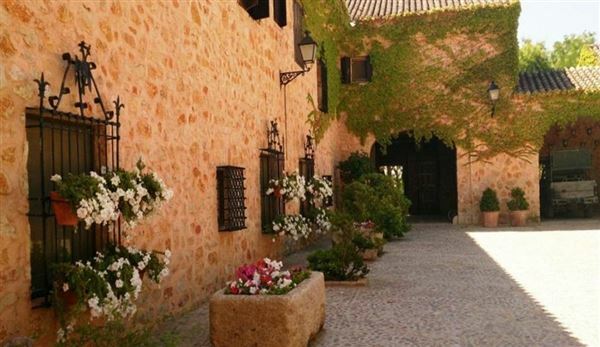 They include the main farmhouse, several patios, a business pavilion and even a beautiful chapel, adorned with a stunning golden facade, making the property ideal for events and as a boutique hotel business too. Amongst the existing buildings there is: an impressive three-story stately house, an authentic 'Quintería' (a typical Manchegan-style farmhouse) which was built by a prestigious Spanish architect, Andrés Rebuelta, who is an expert in this type of construction; the main two-floor house plus two basements and an interior patio, with a total of 1420m2, and constructed following the architectural lines of this type of building: thick stone walls which are over a metre in density, and which isolate the house from the severities of the weather; and the antique property of the estate, over 100 years old, made up of the typical Manchegan patio and two floors with rooms dedicated to service, laundry and industrial ironing, storage, children's bedrooms, etc. In total there are 12 main bedrooms, one of them containing a sauna andhydro-massage bathroom, several lounges, three kitchens, an oven of more than 100 years old, a greenhouse, a pond, a children's park for the little ones of the house and a farm with lots of different animal kinds for family consumption. The region is home to a wide variety of local flora and fauna, which can be found in the neighboring woodland areas. This typical Spanish 'finca' is located around 80 km (less than an hour's drive) from Madrid, and around 40 km from Toledo, with excellent connection to the highway to Madrid and the airport. It has over 10,000 Holm oaks, some of them being more than 400 years old, and a native scrub landscape, which is the only remaining vegetation from Madrid to Albacete. Two south-orientated streams cross the estate, forming two beautiful valleys with lush vegetation: poplars, walnut trees, elm trees, pine trees and scrubland. The slope heights of these valleys range from 20 to 80 metres, being perfect both for a high difficulty level golf course, and for English partridge hunts, with very high-flying birds. The estate maintains and preserves the age-old local agricultural traditions. The estate features numerous allotments and gardens which are used for growing organic vegetables, including potatoes, carrots and tomatoes. 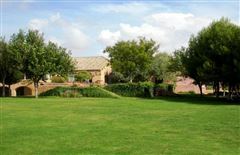 The farm is also home to horses, pigs, dogs, chickens and various other animals which really bring the property to life and give a sense of being on a rustic Spanish farm. The animals themselves are important to the running of the farm, as they contribute to some of the ingredients of the finca's homemade produce. Here, Manchego-style cheese is churned by hand, warm, fresh bread is baked in a wood-burning stove, the traditional dish of "migas manchegas" is prepared, and Spanish Chorizo is also manufactured by hand.